On June 28, members of the Patchogue-Medford High School Key Club put on a fashion show for the residents at McPeak's Assisted Living. In this blend of "old meets new," fifteen students modeled the latest fashions from their senior prom and from years past while a student DJ played music from the 1950s, 1960s, 1970s and the 1980s. After the show, students asked the residents which decade was their favorite and asked them to share their memories from that decade. These students have volunteered their free time at McPeak's by playing games and taking part in intergenerational activities with the residents. Intergenerational programs allow seniors and young adults to share talents and resources to create a unified group identity. Older adults benefit greatly from these programs because they enhance socialization, increase interaction with the youth and prevent isolation and boredom in their later years. 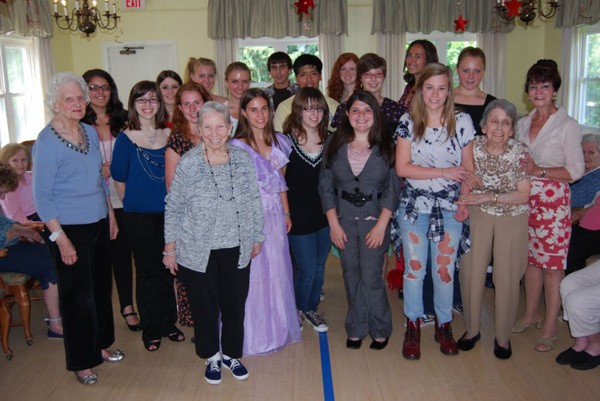 McPeak's Assisted Living residents Ruth Beal (front row, left), Madeline Pedota (center) and Josephine D'Elia (second from right) and Activity Director Linda Ohlsen (right) join members of the Patchogue-Medford High School Key Club wearing their fashions of different time periods during a fashion show at McPeak's on June 28.